When we were customers of other hosting service one of our concerns was related to having our data locked away on servers belonging to another hosting company and the lack of certainty about being able to get access to it should that company hit financial problems. We run fileMaker-hosting.co.uk in a way that means that either partner company could stop trading and it would have minimum affect on the service to customers. All systems can be accessed by either company and when we buy services from others we always consider the ‘what if they cease trading’ or have a ‘fire’ questions that are often not talked about by other companies. As developers ‘we eat our own dog food’ in that we run some of our own systems and our customers systems on the same FileMaker servers your files will be installed on. If a server goes down there is a very good chance we will have it fixed before you are aware there was a problem. This also gives us an interest in ensuring the servers always perform well. Because of this we don’t offer ‘unlimited’ hosting as some of our competitors have done. This is not only because this does not exist in the FileMaker world but also because we would never want to be sharing a server where another user is entitled to occupy all it’s resources. In order to ensure we have access to all vital data should our servers ever fail we do make some use of the competition and so have some experience of overcommitted FileMaker servers. Our servers tend to run at about 15% of processor utilisation and have a massive amount of bandwidth available to them via a variety of routes to the internet. They have battery backup, emergency generators and are in locked racks in a high security facility which is has impressive fire protection. Staff are onsite 24 hours a day and yes we have tested this. In addition we really care about backups. After your file has been with us some time we will have stored perhaps 150 previous versions of it that can be looked at or substituted at your request - if say you accidentally delete some data. We generally make backups on the half hour 24/7 and backups at the top of the hour during business hours. These don’t all go to the same disk. 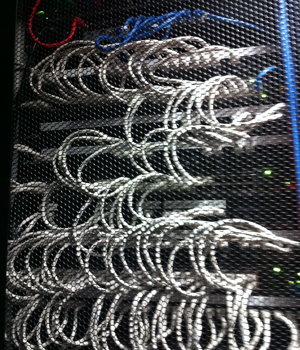 Our servers use a Raid disk and we make an off site backup every night. If you want your own backup copy we also offer an overnight Dropbox update as an optional extra. Lastly we also have a spare server of each type ready to substitute should a production server fail. We have found this to be rare. Mostly these days it seems to be the software getting confused that can cause an occasional issue. When this happens depending on the severity of the issue we do a system reboot either immediately of late at night. If you are that good why the free trial? If you are new to our services we understand you will want to see how fast your database will run and the quality of our service. Some databases run too slowly for internet based FileMaker hosting and some connections are not reliable enough to sustain a continuous connection. It is better for both of us if we find this out before you have agreed say a year of hosting. We do refund unused whole months but it is a waste of everyone’s time. 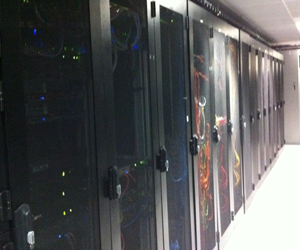 Our data centre is well connected with independent fibres to the internet’s backbone, emergency generators and batteries, strong security, locked racks, staff on hand 24-7-365. Our policy is to have at least one idle standby server for every server type we sell so we can even recover from hardware failures. Our data centre has also received recognition for its low carbon footprint and other awards for innovation. The rack rows (and there are many) are paired back to back with cooled air supplied to the middle cavity. This forces the air through the equipment and help maintain a steady temperature. Our shared hosting service is provided from a UK based ISO 27001 accredited, secure, energy efficient facility with emergency generator and multiple connection routes to the internet.